Pearls are seen as symbols of love and beauty, and no woman is more beautiful than when she is wearing black pearl earrings. These gems are seen as incomparable, exotic and mysterious. Produced in the warm waters of the South Pacific in French Polynesia, the black pearl is among the largest of all pearls and make excellent earrings and they can be matched with a necklace, ring or other jewelry. Tahitian pearls are considered the most popular pearl in the world. Earrings made with these luminous, black pearl earrings are treasured for their rich, deep colors and perfectly round shape, that really stand out in a crowd. Tahitian black pearl earrings are not only large in size, but they also radiate power and confidence from across the room and are not for timid souls. These earrings are strong, lush, opulent and indulgent. The black pearl can be set as a simple stud earring, or combined with settings of diamonds and other gems. They look great with either gold or silver and in settings as diverse as those inspired by the Art Deco movement, or as classic geometric shapes. Polynesian legend says the black pearl was given as a gift by Ono, the god of peace and fertility. They continue to be seen a gift of love and devotion. Any man looking to give the perfect present representing his true love is well-advised to consider earrings made from black pearls. 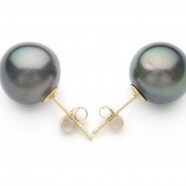 This entry was posted in PearlsOnly and tagged Black Pearl Earrings, black pearls by PearlsOnly Team. Bookmark the permalink.